Quality Engraved Wedding Cufflinks. Dad of All the Walks. and presented in a Black Gift Box as pictured. Silver Plated over copper (lead and nickel safe). Each pair provided with a Black Velvet drawstring bag to keep them in. Hygenically cleaned before assembly. Genuine TED BAKER. Ted Baker Mother of Pearl button cufflinks. High quality round silverplated cufflinks. The first cufflink is engraved "Dad, of all the walks we've taken. along with a date of your choice. The second cufflink is engraved ". Supplied in a smart cufflink case. Beautiful Personalised Silver Plated Cufflinks Father of the Bride Your Little Girl Wedding Date Gift Jewellery. 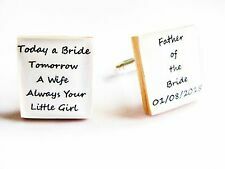 Personalised Father of The Bride Wedding Date Cufflinks. Make that gift extra special with these stunning silver plated engraved cufflinks which are personalised with the wedding date. Suitable for Office Wear, Weddings, Parties, and Other Occasions. At TrendySavers, this is pretty simple and straightforward. At TrendySavers, this is pretty simple and straightforward. 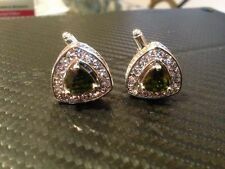 You are viewing a pair of cuff links which will add that extra touch of style to any shirt or suit. For professional office wear, weddings, parties, a night out, and many other occasions. Free Organza Gift Bag. Dispatched within 24 to 48 hours. These classic cuff links will make an impressive addition to any shirt or tuxedo. At TrendySavers, this is pretty simple and straightforward. Simple and versatile design. 11 Fyne Close. Personalised Silver Plated Mr & Mrs Infinity Wedding Date Cufflinks. Beautiful Affordable Personalised Custom wedding Silver Cufflinks and jewellery. (The Mr/Mrs infinity symbol is fixed). This will be engraved in upper case e.g BINGLEY. Silver Plated - Flower Mounted Cufflinks. Silver Plated Cufflinks - Delightful Flower Pendants (Approx 20mm). YOUR CUFFLINKS WILL BE DISPATCHED IN A. White Flower. REF 12667 WHITE - BOXED. RANDOM GIFT BOX. High quality round silverplated cufflinks. (The Mr/Mrs infinity symbol is fixed). Supplied in a smart cufflink case. Mr & Mrs Infinity Round Cufflinks. Set: Xilion Crystal Wedding Cufflinks and Tie Pin. 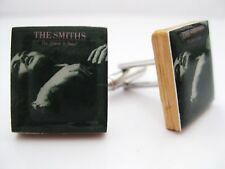 Handmade cufflinks and stick tie pin set. Colour - Crystal (Crystal AB on request). made with SWAROVSKI. 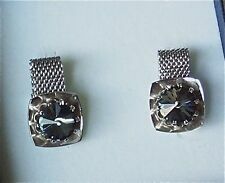 11&7mm Xilion SWAROVSKI. Silver (Gold on request) plated swivel type torpedo fixings and 46mm long stick pin with a pin protector. 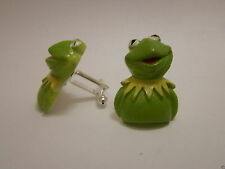 Approximate size of each one of the cufflinks is 1.5 cm x 1.5 cm. 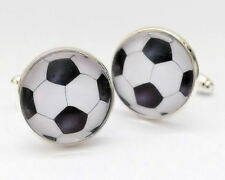 High quality round silver-plated cufflinks. Personalise with your special date. Simply add a date. All other wording is a fixed design. Mont Blanc Cufflinks Silver Stud Capsule Immaculate Condition With Box. Condition is Used. Dispatched with Royal Mail 2nd Class. Mont Blanc Cufflinks. Silver classic capsule design with 'floating star'. Mont Blanc engraved on capsule and fastening clasp. Made in Germany engraved on arm. Absolutely Immaculate Condition. Shipped in black velvet pouch. With BOX. Dispatched with Royal Mail 1st Class. Worldwide shipping. Personalised Silver Plated. New Daddy Cufflinks. High quality silverplated round cufflinks. Each cufflink is engraved with a pair of feet. Supplied in a smart cufflink case. MAKE SURE YOUR DETAILS ARE EXACT AND SPELLED CORRECTLY AS WE COPY PASTE TO AVOID INPUT ERROR . 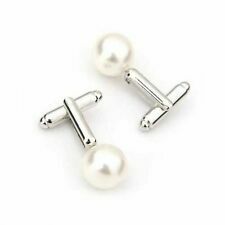 High quality round silverplated cufflinks. The first cufflink is engraved with the fixed text of "Lets Do This!". 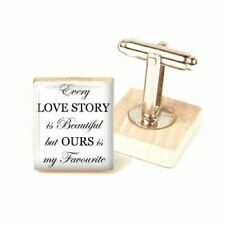 The second cufflink is engraved with the fixed text of "I Love You". Supplied in a smart cufflink case.